Frozen gutters create moisture problems! In CO, we don’t have a ton of mold problems, but I recently came across an outfit that does studies on how mold affects sleep. If you recognize any of the symptoms and think mold might be an issue for you, call us to see if we can identify the problem and figure out a solution! Stay safe cleaning your gutters! Vacuum or blow out any dust, leaves, or debris that has accumulated in the exterior condenser unit over the winter and spring. Remove the condenser cover/grill and wash off the aluminum fins with a garden hose, being careful not to bend or damage the thin metal. If some of the fins are bent, you can carefully straighten the fins with a fin comb. Check the lines running into the house to make sure they are in good shape, and check the condenser unit to see if it's level and steady. Look at the condensation drain line inside the house by the furnace to make sure it is draining correctly and not plugged up or damaged. At a recent inspection, the buyer asked whether there was asbestos in the acoustical ceiling texture (a.k.a., "popcorn" ceilings). The home was built in the early '70s, so there's a good chance that the acoustical ceiling texture contained some asbestos, but the only way to tell for sure is to send off a sample for testing. Should you scrape that off yourself? Consider this free resource before you scrape it yourself. As the weather warms up, many people are heading to their decks to enjoy time outside with family and friends. But most people don't think much about their decks and take their condition for granted. 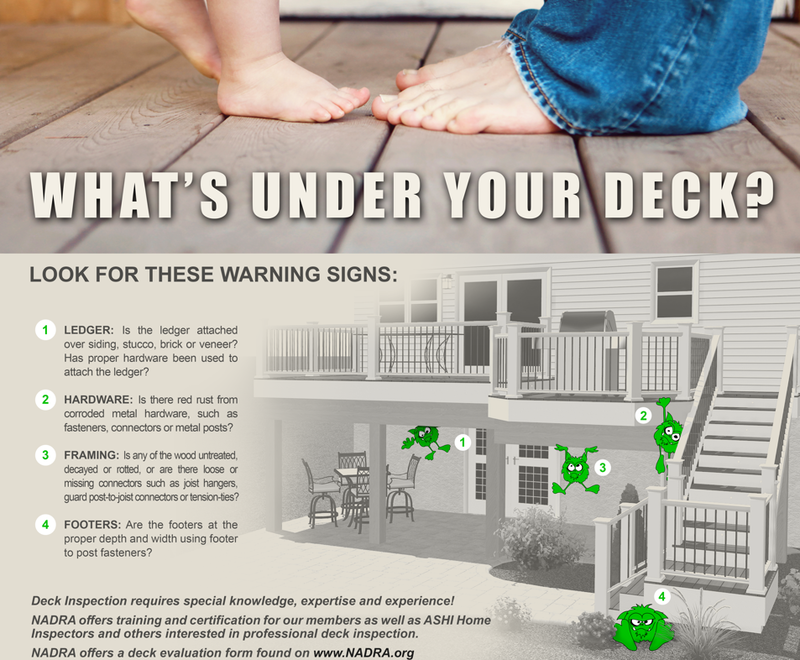 That's why the North American Deck and Railing Association has declared May to be Deck Safety Month, and they are encouraging everyone to Check Your Deck! They estimate that almost 1/2 of the decks in the US are past their useful life and need to be repaired or replaced. Check Your Deck! And if you'd like a professional inspector to give evaluate your deck, call us at Front Porch Inspections. Kidde recently recalled some of its smoke detectors, and you can read about it here at this link. If your smoke detector has a yellow cap inside of it when viewing from the side, it might need to be replaced. Check your smoke detectors! "GFCI" stands for ground-fault circuit interrupter, which is an inexpensive electrical device that, if installed in household branch circuits, could prevent more than two-thirds of the approximately 300 electrocutions still occurring each year in and around the home. Installation of the device could also prevent thousands of injuries each year from burns and electric shocks. Currently, most jurisdictions require GFCI protection for every receptacle/outlet and motor connection in every location of habitable area, as well as areas where the environment might be wet, moist or damp. That means everywhere in a bathroom, all the countertop outlets in the kitchen, and within 6 feet of the sink at the wet bar. It also means everywhere outside. Circuit-breaker and receptacle-type GFCIs may be installed in your home by a qualified electrician. Receptacle-type GFCIs may be installed by knowledgeable consumers familiar with electrical wiring practices who also follow the instructions accompanying the device. When in doubt about the proper procedure, contact a qualified electrician. Copyright 2018 InterNACHI, used by permission. The bottom line is, if you properly grade the areas around your house and divert the water away from the house, your basement most likely will never get wet! Keep the water away from your house and you will never have to worry about getting it back out. Where Have All the Waters Gone? You probably don't think much about where snow goes when it melts from on top of your roof, but it's a critical issue in home maintenance. Water is the great enemy of foundations, so you want to get it 5' to 6' away from your foundation. Splash blocks and downspout extensions can help manage this moisture, but only if they're present, in good condition, and not backed up with snow/ice. "Missing Downspout Extension or Splashblock" is a very common deficiency I see regularly in the homes I inspect. In the picture below, water is leaking out the back of the downspout extension, right next to the foundation. 1. Don't cover everything up! If you have soffit vents (vents in the underside of the eaves of your house), don't cover those up. Those need to stay open and clear, so if you're adding insulation, you can buy cardboard or plastic "baffles" to make sure insulation doesn't cover those vents, which are necessary for your roof to ventilate properly. 2. Know what the kraft paper/vapor barrier does and when to use it. In general, if you're adding insulation to your attic, you shouldn't use the insulation with a vapor barrier. You don't want to trap moisture in your attic between layers of insulation. 3. If your house has spray-on insulation (foam) on the roof deck (up against the trusses/rafters), disregard this post! This post is intended for conventionally insulated homes, and insulation on the roof deck and framing relies on a completely different philosophy of building science. Feel free to call Front Porch Inspections if you have any questions regarding this post! When was the last time you checked the amount of insulation in your attic? Adding insulation can significantly improve your energy efficiency this winter, with minimal cost and labor. In fact, this is one of the best DIY projects you can do to improve efficiency and lower your heating bills. Even adding a few inches of insulation (with either batts or blown-in) will make a big difference! But be careful—there are a few things to be aware of before you go wild with new insulation! It's been a few days since the last snow fell, and you might be tempted to forget shoveling and just let it all melt away. But consider this: snow removal should be seen as a necessary part of home maintenance! Snow = Water, so the more snow you can get to melt/drain away from your home, the less likely you are to get water in the basement or crawlspace. Plus, snow can melt into the cracks between your concrete, which can then freeze and expand overnight as temperatures drop. This can lead to premature cracking, pitting, and spalling of the concrete. Shovel your snow this winter to keep your home looking in good shape! ...Gallegos Sanitation called and wants its recycling bin back! If you look closely at the picture, a resourceful homeowner has covered one of his (hopefully!) unused chimneys with a recycling bin from Gallegos. Kudos for ingenuity, and every chimney does indeed need a rain cap, but a recycling bin is not the appropriate solution. Make sure your chimney 1) has a rain cap/spark arrestor, 2) is in good working order for the winter, and 3) is not using a Gallegos recycling bin! Your chimney works hard for your home, but it probably doesn't get the attention it deserves. For example, when was the last time you even looked at it, let alone examined it for wear and tear? I neglected my chimney and ended up having to replace siding, trim, and even some of the framing. The paint and caulking had worn out and water had gotten behind the siding, which rotted out much of the wood. Give your chimney some love! Can you spot the problem in these garages? The garage walls serve as a fire break to slow the spread of fire from the garage to the inhabitable space of a home should a fire break out from paint or gasoline stored in the garage. But many times I see that this firewall has been compromised in one way or another. At a recent inspection, the homeowner had installed a pet door through the wall leading into the garage, which compromised the firewall. At another home, the door from the kitchen to the garage did not close on its own because its 1 spring hinge was not sufficient to close the door by itself. This, too, will compromise the firewall. So will a heating/cooling duct cut into the garage. Check your garage walls for your own safety. Or better yet, let Front Porch Inspections check them out for your! Wishing you all a happy Thanksgiving with your families!